phase. 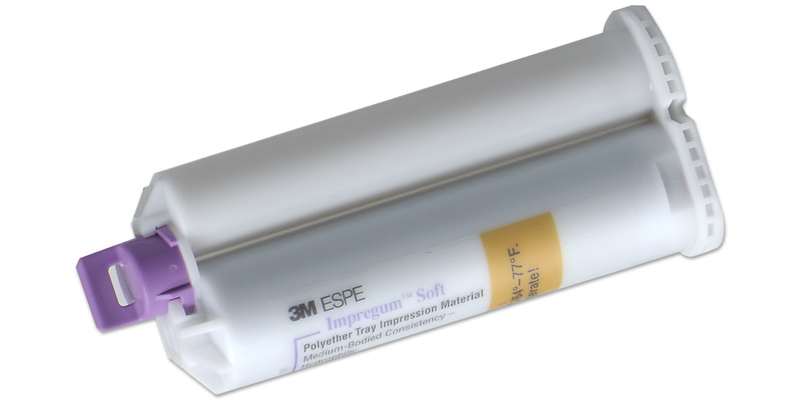 “Soft” generation polyether makes removal from the mouth easier. Improved mint taste and smell. Can be dispensed from your current impression material automix gun dispenser. Contains: 4 x 50ml cartridges; 10 white mixing tips; 5 unfilled intraoral syringes. Contains: 4 x 50ml cartridges; 10 purple mixing tips. Contains: 3 x 50ml cartridge Soft Tray; 1 x 50ml cartridge Soft light body; 10 Garant purple mixing tips; 10 Garant white mixing tips; 10 Garant white intraoral tips; 1 x 17ml bottle polyether tray adhesive. DS 50 dispenser 1:1/2:1. Includes red clip for dispensing smaller amounts. Impregum Soft earned 4.5 stars out of a possible 5.0. Better flavor than original version, two set times, three viscosities, cartridge and Penta dispensing. The regular version remains the gold standard for full arches. Our tests confirm its more than adequate working time. The flow from the syringe version will completely fill the shark fin. Increased flexibility makes it significantly easier to remove from the mouth, eliminating most of the anxiety of removing a full arch maxillary impression, and does not pose as much of a threat in removing other restorations. Taste still more unpleasant than the neutral taste of the vinyls. Quick Step is "faster", but don't confuse this with "fast set", since the regular set time of 6.0 minutes has been reduced to 4.0 minutes. While any reduction in time is good, 4.0 is still rather pokey for 1-2 units. Tray material may not be hard enough to use in a flexible sideless tray for closed mouth impressions. Overcomes most of the taste and rigidity objections, has terrific flow, and is probably the product of choice for full arch purposes, but it still can't compete with the ubiquitous vinyls in the 1-2 unit, fast set arena.